Established by Congress in 1939 under title 14, §§ 23 of the U.S. Code, the United States Coast Guard Auxiliary is Semper Paratus(Always Ready). We invite you to explore our site and learn more about who we are and what we do to be "Semper Paratus." 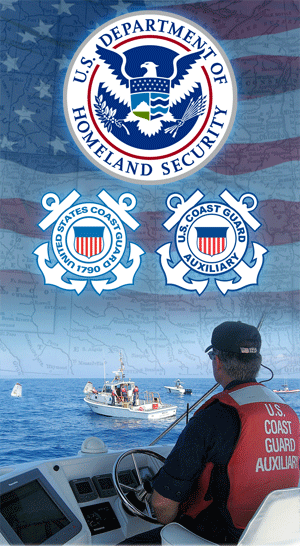 In addition to the above, the U.S. Coast Guard Auxiliary operates in any mission as directed by the Commandant of the U.S. Coast Guard or Secretary of Homeland Security. 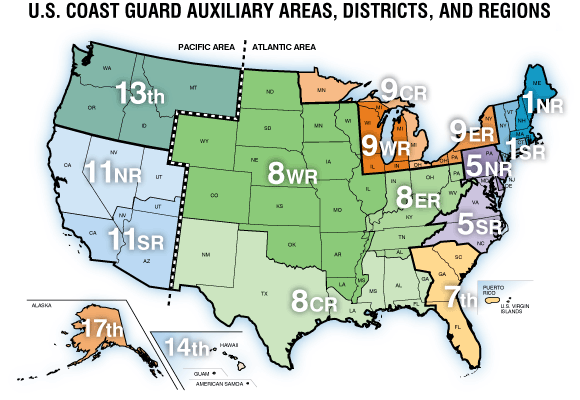 The Auxiliary has units in all 50 states, Puerto Rico, the Virgin Islands, American Samoa, and Guam. Under the direct authority of the U.S. Department of Homeland Security via the Commandant of the U.S. Coast Guard, the Auxiliary&apos;s internally operating levels are broken down into four organizational levels: Flotilla, Division, District and National. National - The national staff officers are responsible, along with the Commandant, for the administration and policy-making for the entire Auxiliary. District -The District provides administrative and supervisory support to Divisions, promotes policies of both the District Commander and National Committee. Division - Flotillas in the same general geographic area are grouped into Divisions. The Division provides administrative, training and supervisory support to Flotillas and promotes District & National policy. Flotilla - The Flotilla is the basic organizational unit of the Auxiliary and is comprised of at least 15 qualified members who carry out the day-to-day missions of "Team Coast Guard". Every Auxiliary member is part of a Flotilla. When the Coast Guard "Reserve" was authorized by act of Congress on June 23,1939, the Coast Guard was given a legislative mandate to use civilian to promote safety on and over the high seas and the nation's navigable waters. Two years later, on Feb. 19, Congress amended the 1939 act with passage of the Auxiliary and Reserve Act of 1941. Passage of this act designated the Reserve as a military branch of the active service, while the civilian section, formerly referred to as the Coast Guard Reserve, became the Auxiliary under title 14, chapter 23 of the USC. When we entered World War II, 50,000 Auxiliary members joined the war effort as military teams. Many of their private vessels were placed into service in an effort to protect the U.S.